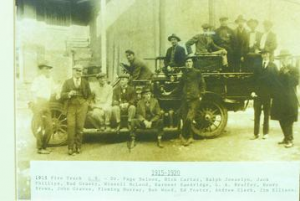 The Crozet Volunteer Fire Department has a very extensive history that dates back to 1910 when it was established as one of the only Fire Departments in the county. Back in the early 1910’s the early fire notification was a siren that was installed on the Cold Storage building (mountain side). There were six people with a button to turn on the siren, each person had a ground wire run to their house. This ground wire completed the circuit which energized the siren. The single phone number for the fire department was 823-4000 which was long before the 911 dispatch system was ever created. Six people had this phone number on a phone in their house and when called it would activate the siren. Whoever answered the phone would stay on the line till someone arrived at the fire house and picked up the phone. The person at the fire house who took the call would write the location on the chalk board. Most of the time the person who took the call missed the engine. Crozet at the time was divided into 4 quadrants and the siren would tell the members which quadrant to go to. Block 1, which is present day Fruit Growers, was one long and one short blast on the siren. Block 2, which is present day Dairy Queen, was one long and two short blasts on the siren. Block 3, which is present day Mountain Side, was one long and three short blasts on the siren. Block 4, which is the Square present day, was one long and four short blasts on the siren. For structure fires the signal was repeated several times on the siren. The original water supply was four and six inch lines gravity fed from Mint Springs. Captain Clerance Bly, who was a retired Arlington County Firefighter, helped Crozet Fire Department to get its first gear. Crozet simply used regular hardhats for protection. The first trucks were chemical pump trucks, which mixed water and a chemical to create pressure to spray water. The original firehouse was built in 1930. 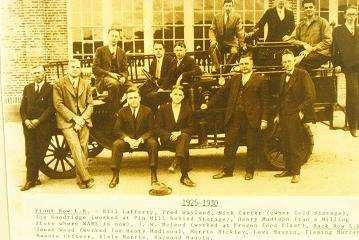 In 1937 A brand new engine, 1937 Seagrave, was bought and delivered to the fire department by train car. The 1937 Seagrave is still in working order, pump and all, and still stationed at Crozet Volunteer Fire Department. In the later 1950’s the second lake went dry at Mint Springs and Men from Crozet gathered up six inch irrigation pipe and ran a line from Henley’s lake to Mint Springs. In 1962 John Beam left a green engine at Crozet Fire Department for a couple of months to see if they liked it. At this point Crozet Fire Department got their first air packs from Sutton & Clark in Richmond. High pressure (900 PSI) low volume pump was used in Crozet, which used a ¾” hose and variable nozzle to break up the water to absorb BTU’s. Crozet was the first to use 1 ½” hose for fire attack, which moved away from the high pressure booster reels. A new fire house was built next to the old one on 810 in 1965. The current fire house was built on route 240 in 1985, while the rescue squad bought the old fire house on 810 and moved in. 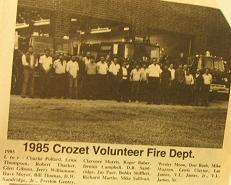 1990 Crozet was the first to have class B foam piped in to the pump on an engine. 1992 Crozet was the first to have class A foam piped into a brush truck for more effective brush fire fighting. 2003 Crozet was the first station in the county to purchase a brand new engine with Compressed Air Foam System (CAFS), which is some of the newest technology in fire fighting..